I don’t think the Bulls can beat the Miami Heat in the conference semifinals, but anyone makes a mistake discounting what the Bulls can accomplish no matter how great the odds. “We’re excited for the challenge of playing against the best team,” Joakim Noah was saying late Saturday night amid the intoxicating aroma of Game 7 victory in Brooklyn. It was a terrific win, one of the best in Bulls franchise history given the circumstances of being the first ever in a playoff seventh game on the road and without so many regulars. But that was a fourth place Nets team apparently anxious to fire its coach, which it did Sunday, and led by a lethargic leader, Deron Williams, who couldn’t have seemed more bored and disinterested in comments afterward, as if the season was an annoyance in the way of picking up his checks. Noah paused and you could almost see his mind racing at the possibilities after his magnificent 24 points, 14 rebounds and six blocks, five against All-Star Brook Lopez. LeBron James again, no one giving the Bulls a chance with perhaps Luol Deng and Kirk Hinrich out again along with Derrick Rose, the national voices dismissing them as so many did against the Nets after the Game 6 home loss. Yes, that’s a delicious setting. A widening gap toothed smile began to spread across Noah’s face. “We’ll see what happens,” he finally said with a mischievous grin. Not that the team with the best record in the league at 66-16 and on an astounding run of 41 wins in their last 43 games should fear anyone. Though you know Heat players had to be rooting for Joe Johnson to at least make a few more shots Saturday. Soft is an overused, mostly inaccurate shortcut cliché for sports. The Nets aren’t soft in the terms of weak. They perhaps more carry a relaxed attitude toward their work. They like to look good along the way. Not much the Bulls do, especially with Noah’s less than iconic shot and a driving layup that looks someone scrambling out of a burning building, isn’t particularly artistic. So they mostly, though not all, bump and bang and shove and grab and will themselves to do just a bit more. They don’t much pose, which is a good thing if you’ve ever seen Noah’s post game outfits. Not that James can’t play any sort of game. He’s as tough as there is. But no one much likes all the shoving when you’d like to pose for a poster. Even James got tired of it, though mostly in frustration, when the Bulls broke the Heat’s 27-game winning streak in a classic late March game. It was a sort of ides of March assassination of their streak, which they seemed sure would surpass the Lakers’ 33-game record and probably would have. James, uncharacteristically, complained to reporters afterward about taking hard fouls that don’t get called. It, of course, was ridiculous given how few fouls are called against James, and the next game between the teams the officials took notice with Miami shooting 41 free throws. But the point was how the Bulls got James’ attention. Hardly anyone does. It makes for a possibility, anyway, because the Bulls can pull Miami into its sort of game. Both are good defensive teams, and Miami, in fact, ranked sixth in the NBA in lowest opponents’ field goal percentage. 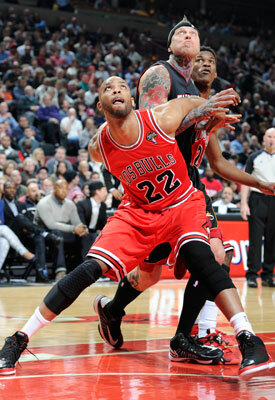 The Bulls were ninth with a late season slump with Noah and Taj Gibson hurt. Thanks to James’ improved shooting, the Heat is one of the most efficient teams and finished the season first in shooting percentage and fifth in scoring. And it’s hardly all dunks. They also were second in three pint shooting percentage with a very effective system that relies on spreading the court and making teams react to James or Wade and then hitting open shooters. They were seventh in assists and an unselfish team. The obvious game plan against them is always not to turn the ball over to prevent their fast breaks and crowd raising dunks. Much easier said, of course. The Bulls play them a bit differently than most as the Bulls don’t double team as much. They rely on a regular defense that offers help in the form of a stunt. In effect you show a defender to the shooter or ball handler and then are charged with getting back to your man, especially at the three-point line. They’ll deny the middle and try to usher the pick and rolls to the baseline where they can trap. Both teams are good at running shooters off the line. They both want you to take tough two point shots. They’ll live with you making those figuring they won’t lose that way. The Bulls edge on Miami has been rebounding, an average of about nine per game more this season. The Heat led by James at 28 per game and a spectacular 63.8 percent shot 49.1 percent against the Bulls, though the Bulls kept them off the three-point line where the Heat was just 30 percent in the four game split. It probably will settle into basketball without all the clichéd imagery. Wade might be the pivotal figure because he’s had knee problems. You don’t stop James. 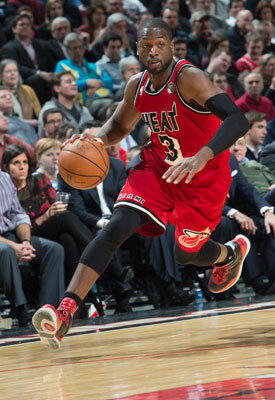 But Wade has had tough times alternated with spectacular games against the Bulls. Though Miami won in five, he had a tough go in the 2011 conference finals. He averaged 19.8 against the Bulls this season settling into his supporting role to James. James tends to become something of a point guard for the Heat as Bosh will move outside. They’ll go to Chris Andersen off the bench, an energy player like Noah. Generally, the Bulls will start Carlos Boozer on the inoffensive Udonis Haslem. But Boozer, who led the Bulls against Miami averaging 19 points and 15 rebounds, would then have to switch to Bosh if Noah gets the active Andersen. Boozer generally doesn’t move outside as well and Bosh has prospered in those situations. The Bulls will need a better Taj Gibson, who only averaged two rebounds against the Nets as his knee obviously isn’t right. Depending on the availability of Deng, Jimmy Butler could play James or Wade. If Butler defends James, Marco Belinelli would move onto Wade, which makes for a much tougher time for the Bulls as the Deng/Butler combination is their best on the perimeter. Similarly if Hinrich isn’t able to go and Robinson has to defend at point. It’s an easier task against Mario Chalmers and Norris Cole for Robinson after Deron Williams, though Chalmers has had big games against the Bulls. Conversely, Boozer has had big games against the Heat and he and Butler, the latter with his slashing moves, have gotten to the free throw line the most among the Bulls players against Miami. Perhaps Thibodeau unwraps Richard Hamilton in this one as Hamilton has had some good games against Wade, who has said he doesn’t like playing against Hamilton after their battles for years. It’s difficult to say it’s a great rivalry yet, though there have been great games, like this season’s streak breaker, the final regular season game of the 2010-11 season when Miami players supposedly were in tears after the loss, the Heat comeback in the last three minutes to clinch the conference finals in five games in Chicago, the physical final regular season game in 2011-12 when Miami went to goon tactics as much as anyone has seen them. The Bulls are 7-4 against Miami in the last three regular seasons combined. The Heat is 4-1 the only time they met in the playoffs. That’s 8-8 in three seasons. So perhaps it can come down to a seventh game again.